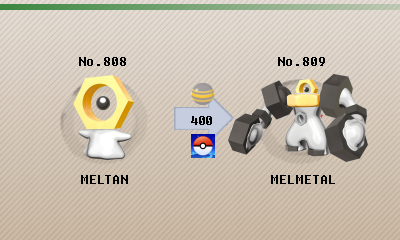 Melmetal, The Hex Nut Pokémon. Revered long ago for its capacity to create iron from nothing, for some reason it has come back to life after 3,000 years. Note: The EV spreads shown in this article are based on the assumption of a return to the normal scheme. For battling in Let's Go, Pikachu! & Let's Go, Eevee, the recommended spreads are always 200 AVs in each stat and no hold items can be used. The evolution of the mysterious new Pokemon introduced in Let's Go, Melmetal is an interesting Pokemon following the template of most of the Gen 7 Pokemon: tanky bases with good power but low speed. In Melmetal's case it may play in its favor as Steel is a strong defensive typing, and it will likely make good use of an Assault Vest in future games, but probably won't rise higher than mid-tier in competitive ranking with its current movepool as it lacks much utility. 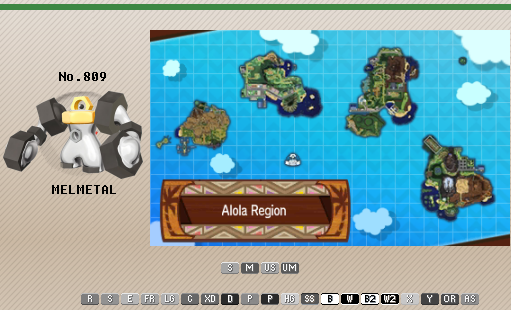 However, it is currently difficult to see where Gen 8 takes Melmetal since Let's Go movepools are less expansive than usual. For the time being Melmetal stands as one of the very few Steel-types in the Let's Go environment, giving it a very unique niche shared only with Magneton, Alolan Sandslash, and Alolan Dugtrio. 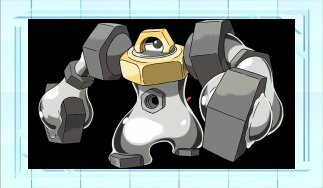 Add in its signature Double Iron Bash and you're looking at a very beefy physical tank with some big power, so Melmetal will likely not disappoint. Typing - Steel is a great defensively lending to Metmetal's durability. While Steel is alright offensively, this is more a positive for staying around and absorbing hits. Most other Steel-types in Let's Go aren't particularly durable which makes Melmetal unique in that regard. Bulk - Speaking of its durability, 65 base Special Defense is admittedly bad but 135 base Health and 143 base Defense are great. This in combination with an Assault Vest will make Melmetal in theory similar to Tangrowth minus Regenerator. Speed - Melmetals Speed is terrible, meaning revenge killing it is very easy as well as limits its set utility to tank or utility as a Choice Scarf is made useless with base 34 Speed. This otherwise makes it very reliant on Trick Room support to outspeed foes. Note that Trick Room does not exist in Let's Go as well. Movepool - Melmetal has a weird movepool and is subject to change but as writing, it's not great. Steel and Electric moves make up most of its options and synergize fine with each other, but it leaves problems for some big Pokemon such as Ferrothorn. There are coverage options such as Superpower and Earthquake as well as a surprise Ice Punch so it's not a weak movepool by any means, but it's not particularly standout for a Steel-type. Iron Fist - Raises punching moves power by 1.25% - Good ability especially since its signature move gets a boost from this. However, since abilities are not present in Let's Go this will not be relevant for awhile. With an Assault Vest Melmetal acts as a powerful tank, sponging a decent amount of hits from either side. Double Iron Dash is the main move, hitting threats really hard with the STAB and Iron Fist boost. Earthquake is strong secondary coverage that allows Melmetal to threaten opposing Steel-types, but Superpower can be used to hit some threats such as Ferrothorn. Ice Punch and Thunder Punch round out the set with strong coverage against big threats such as Skarmory and Gliscor. Ice Beam and Thunderbolt can be argued due to Melmetal's 80 base Special Attack, however Ice Beam has the strongest case with most Ground-types being physically bulky. In the current Let's Go environment most of these Pokemon won't be relevant and the given EVs, ability and item are not applicable. However, a Brave nature is preferred to buff up Melmetal's Attack while dumping its otherwise hopeless Speed. An Adamant nature can also be chosen if you wish to outpace opposing Melmetal though. The key moves here are Thunder Wave and Toxic. Thunder Wave makes Melmetal great at supporting things that use Swords Dance or Nasty Plot as it allows those Pokemon to easily outpace threats they may not normally. Toxic functions similarly crippling bulky Grounds and Waters that wall Melmetal quite easily and makes it easier to break them endgame. Ice Beam is nice to hit physically bulky Ground-types threats harder than Ice Punch, though it will usually be better to use Ice Punch anyway. Meanwhile Double Iron Dash is solid general damage that can break Substitute while also dealing damage. Substitute or Rest can be run over Ice Beam for longevity due to Melmetal's big Substitutes getting over the 101 health benchmark while Rest just heals. If Awakening Values are in play Substitute is not particularly relevant though. Choice Band - Melmetal has the Attack and enough coverage to make a Choice Band punishing. Otherwise it's difficult to gauge potential alternatives seeing as Let's Go only gives it a handful of options to work with and no held items. Rotom - With access to Levitate to dodge Earthquakes and use of Volt Switch to get Melmetal in easier, most Rotom forms are good options. Rotom Wash is the best as it can sponge Fire moves and pressure back, but Rotom Heat is also good for similar reasons even if it doesn't always threaten them out. Dragons - Melmetal's ability to break or cripple Physical walls means most Physical sweepers like it, but Dragons are the best as Melmetal will force Steels in and its ability to check Fairy types is huge. Good options are Haxorus, Dragonite, Zygarde, and Druddigon. Bulky Grounds - Ground-types are immune to Electric moves and often boast high Physical defense, so they make a good general answer to Melmetal as the only option is Ice Punch. Options vary based on the tier but good options are Hippowdon, Mega Camerupt, Steelix, Nidoqueen and Palossand while more offensive ones such as Krookodile, Dugtrio, and Nidoking can pressure it out. The classic Landorus-T and Garchomp can also threaten it but they fear an Ice Punch a bit more than the others. Fire Types - With the general high base Speed and Special Attack, most Fire-types can revenge kill Melmetal with ease. STAB Steel doesn't help this issue either as despite how frail most Fire-types may be, they can sponge a hit. Good options are Heatran, Salazzle, Moltres, and Charizard. Bulkier Fire-types also can just wall Melmetal such as Rotom-Heat and bulky Mega Charizard X. However, grouded Fire-types should be wary of a potential Earthquake, especially Heatran. 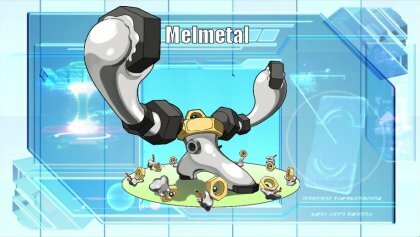 Melmetal has yet to make an appearance in the anime.